Yes, this is how mega corporations invest their funds: By sending out email to anyone with an email account, and taking replies only through a yahoo.com email address. And, of course, they'll gladly put thirty million bucks into any ol' bank account, even if it's some shaky local bank whose accounts are insured only to $100K. As loony as this 419er appears to be, I can also envision a recipient on the financial edge being desperate enough to get caught up in this scam in the hope of skimming a little something off the top. In this battle of Greed vs. Greed, funds move only in the direction of the 419er. Last News in video format! Only Best and hot news! Last new: The American junky eats the eyes. Look at sample! The destination program redirects to a page that automatically downloads a file named video.avi.exe, for which VirusTotal reports a pretty dismal 10/35 identification rate. These guys also took the time to program some strange stuff in the message header. In particular, they insert a second Received: header line making it look as though my email server generated the line (which it definitely did not). The (presumably botnet) program that sends the messages customizes each message's extra Received: line. There is also a mistake in their program because the line includes two placeholders for randomized numbers. D'oh! Given the low virus program detection for the payload, this could be a pretty nasty chunk of Bad Stuff. Don't go there. Although "tabloid" generally refers to the physical size of a newspaper page—smaller than the traditional newspaper page—here in the States the term more commonly connotes newsprint publications that have glaring and sensational headlines. Visit nearly any grocery store checkout line, and you'll see copies of The National Enquirer, The Globe, Star, and others shouting headlines about celebrities (dead, alive, or otherwise) in dire situations, UFOs, freaks of nature, bogus medical breakthroughs, and so on. The veracity of the stories and photos...well, I find it hard to believe that JFK had a love child with an alien from another galaxy. These are just some samples of the subjects and bodies of malware-luring spam that arrived here over the past few days. And these aren't the really sick ones. The destination pages of the URLs supplied in the messages typically include a link that supposedly shows a video, but in truth downloads an executable malware loader. At the same time, those pages silently try to load malware through an invisible iframe element—particularly targeting unpatched Windows machines visiting with Internet Explorer web browsers. From my peeks into the iframe script attacks, it seems to me that more than one gang is at work here. Thus, the gangs appear to be competing for victims' attention through increasingly outlandish email lures. It's like being in the supermarket checkout line while sitting in front of your computer. But when you're checking your iPhone email while actually standing in the checkout line, you are sucked into a vortex that makes you believe that Angelina Jolie's twins were delivered looking exactly like Sonny and Cher. After verifying that the destination of the link (to a free web hosting service) wasn't going to blow up my computer, I checked out the page in a web browser to see how this crook was going to try to pry personal identity info from visitors. 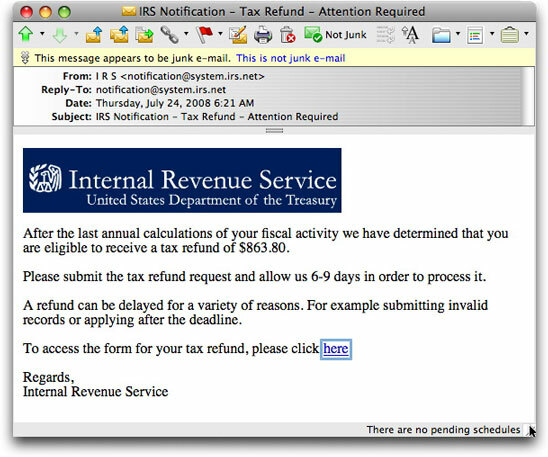 In the past, IRS phishing scams have aimed at Social Security numbers (the primary way the IRS distinguishes one private citizen from another) and credit card data (where the refunds are supposedly to be credited—what a joke!). 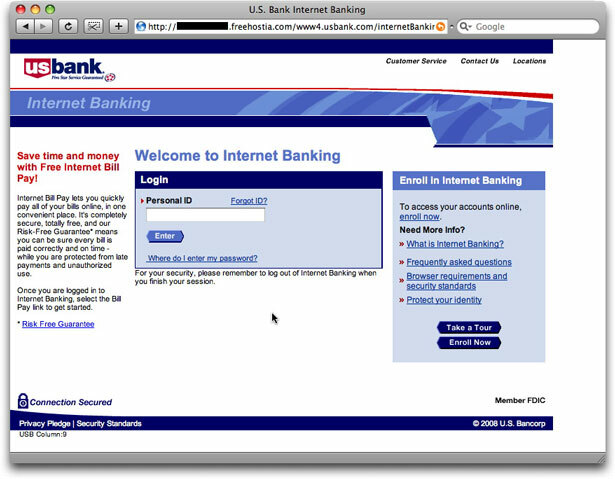 Yes, friends, this guy had set up bogus login pages for every one of the banks in the list. In other words, by way of a single style of phishing message from an organization that would get every U.S. citizen's attention, this crook has found a way to phish for fourteen financial institutions! 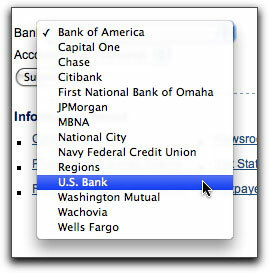 No more confusion for recipients who are, say, Bank of America customers but who receive a phishing message about Washington Mutual. One scam fits (nearly) all! 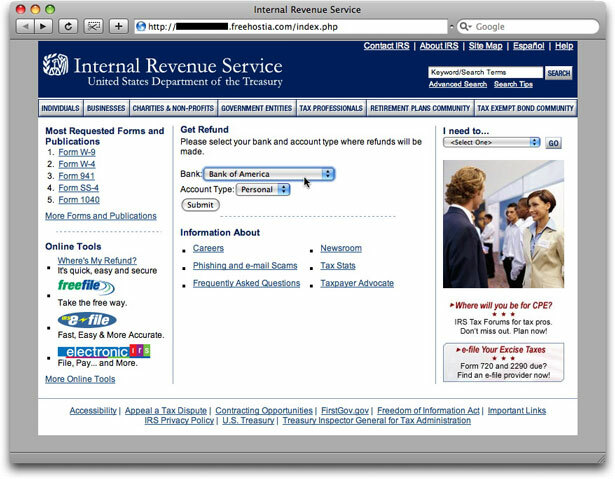 So, this really isn't an IRS scam. It's a Massively Multibank Online Phish, or MMOP for short. To freehostia.com's credit, the entire site was taken down within a couple hours of my phishing message having been sent. A lot of work went into creating all that content—I mean, this guy had to rip off login screens from 14 bank web sites—so I fully expect the full package to resurrect itself elsewhere in the future. It seems that to Ben Franklin's precious list, "death and taxes," we must add "scammers." Storm-like malware lures are flowing now with subjects and message bodies referring to an imaginary currency to replace the (sagging) U.S. Dollar, Canadian Dollar, and Mexican Peso. They call it the Amero (get it, an American Euro?). You have to admit that these crooks sometimes go to a fair amount of effort to make their clickable lures appealing to the unwary. These guys keep pushing the Outrageous meter into the red zone with their email messages and phony sites (case in point, one that just arrived—Subject: Police open fire on elderly in Iowa). Pretty soon, you won't be able to believe anything that arrives in an unsolicited email. Heh heh. I love it when a spammer screws up such that any spam that gets through filters is bereft of meaningful content—there is no action that the user can take to benefit the spammer. 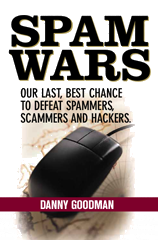 It means that the spammer has expended something of value that is guaranteed to generate zero return. Most of the Subject: lines suggest that the message is about an order renewal. Of course there was never any original order to renew, but he hopes that mention of a renewal will get recipients to open the message. Something in either the spam-sending bots or the way he's commanding the bot senders is cutting off the message part way through the email header. We inform you that your account is about to expire. It is strongly recommended to update it immediately. Update form is located here <http://digitalinsight.ebanking-[removed].com/onlineserv/CM/> . However, failure to confirm your records may result in account suspension. Confidential: Please be advised that the information contained in this email message, including all attached documents or files, is privileged and confidential and is intended only for the use of the individual or individuals addressed. Any other use, dissemination, distribution or copying of this communication is strictly prohibited. This is the automated message. Please don't reply. From what I can gather at the legitimate web site for the company, it provides software and services to financial institutions so that those institutions can offer online banking. In other words, the customers aren't consumers, but financial institutions. The company claims to have nearly 1800 customers, almost all of which must have at least a modicum of interest in online security. Thus, it seems odd to me for a phisher to try to spew phishing spam willy-nilly in the hopes of finding not only one of the 1800 customers, but to also find one who is gullible enough to fall for a phishing message. On the other hand, I've received phishing emails for tiny regional banks in the past, so this isn't completely out of the ordinary. Perhaps the phisher is under the impression that because Digital Insight is an Intuit company that the login credentials might also work at an Intuit account. Kind of a stretch to me, but then I'm not a crook (jowls wobbling Nixonesquely). The links for the several phishing messages I've seen lead to freshly minted domains whose (gotta be bogus) whois records list a variety of Russian and neighboring country addresses. 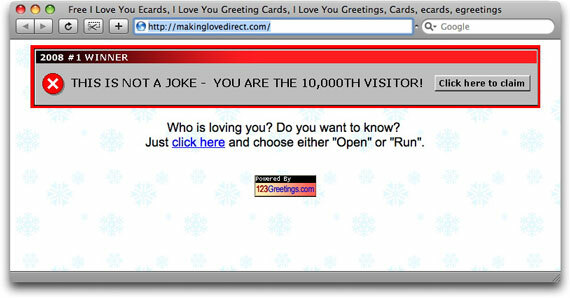 The phisher is also having a helluva time getting the sites to work, or work for long. But he's still trying. It reminds me of a story that Dr. Murray Banks, a comedian-psychiatrist, used to tell about a child who was unstintingly optimistic. When his parents gave him a box of horse dung as a Christmas present, he dove headlong into the contents and clawed his way through the muck, yelling, "You can't fool me...I know there's a pony in here somewhere!" At least he didn't make any references to a microorgan-ism. Note that the registrar here is internet.bs, where the .bs country code top-level domain is for the Bahamas. I can imagine a laid back lifestyle in the Bahamas, but the coding behind this error message is just too laid back. I mean there must be code branches that trigger errors (raise exceptions) for each of those cases. The programmers clearly are aware of the possible cases and even have error wording for each case. I get the feeling that if any error condition occurs, they simply spit out the whole list, rather than report the specific issue that raised the exception. Supplying too much information in this case equals supplying no information. 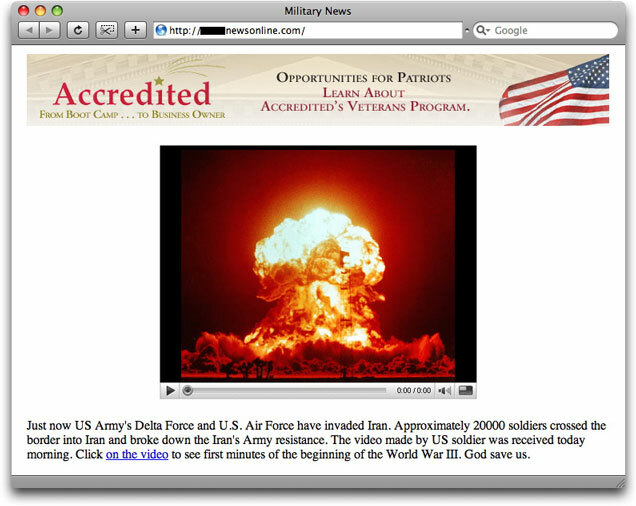 Clicking on the upper banner image downloads form.exe; clicking on the fake movie player image downloads iran_occupation.exe. The page also includes the same hidden iframe attack with the ind.php program described at length here (PDF file). News of this nature would obviously be monumental, if it were true. Check with cnn.com or other trusted news sources before clicking on any link in an unsolicited message, no matter how official the link's domain may appear. This has happened to me a few times in the past, but it's no less creepy when it happens again. I received an email from Apple today supplying me with instructions on how to reset my Apple ID password. This is the kind of message you get from a account suppliers when you click the "Forgot password?" button or link on login pages. Now, before you think it might have been a phishing trick, I checked the message's headers and closely examined the URL supplied in the message. The body of the message addressed me by the name I use with my Apple ID account. This really came from Apple, no question about it. It means that someone had entered my login address into an Apple login page and clicked that button. Did someone try to get into my account by testing some passwords? Quite possibly. An Apple account is a valuable target because it's the gateway to buying iTunes and Apple Store stuff. Many of the screenshots I've posted in this blog clearly reveal me as being a Mac guy, so it would be logical that I'd have such an account. As I've said before, if you have something of value, one or more crooks will try to take it from you. Just to be sure, I manually logged into my account and found everything to be in order. If crooks believe they can find clues to my passwords in the verbiage of my web sites, they're sadly mistaken. Or, from my point of view, gladly mistaken. 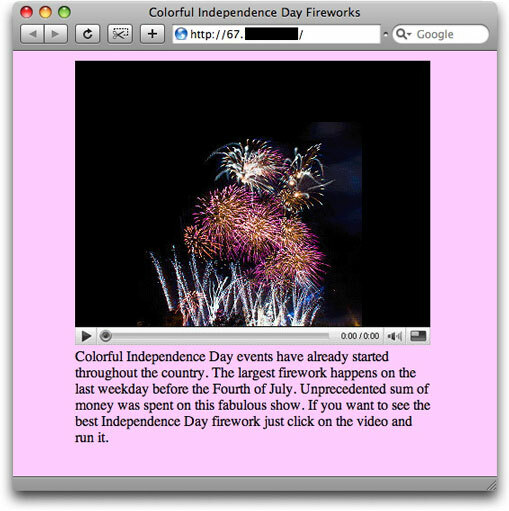 Content is a false video player image, which is a link to download fireworks.exe, a malware load that VirusTotal shows identification by 15 of 33 antivirus systems. But the page also includes the same hidden iframe element and ind.php program described in Love Hurts Even More. Check the scripting analysis document linked from that post to learn more about this multiple-exploit drive-by attack. Don't let this M-80 explode inside your PC. UPDATE (4 July 2008): Just saw this subject line variant: "Stars and Strips forever." Ooh, so close. Sounds more like an ad for a Las Vegas adult revue. 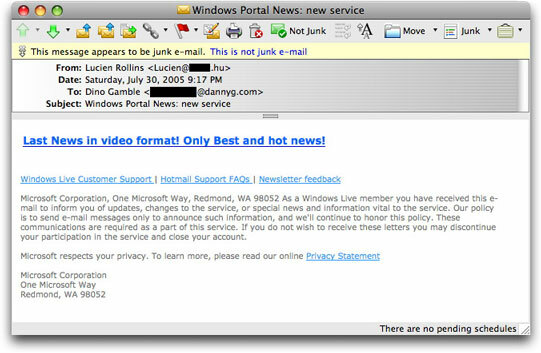 UPDATE (6 July 2008): On July 5, the same email messages continued to arrive, but with links to domain names rather than numeric IP addresses. The domain names I've seen have the word fireworks embedded somewhere within.